Google The Unplanned Homeschooler: Free stationery for Minecraft fans! My older daughter just got her first pen pal, a friend her age who she met while playing Minecraft in one of the Minecraft Homeschool classes. Her friend's mom and I connected through Facebook, and agreed to let the girls write to each other offline. I had a pen pal when I was young, and one of my favorite things about writing letters was using my special stationery. My aunt had bought it for me, and I saved it for special correspondence. I remember vividly, it resembled a bright red gumball machine with bright gumballs of every color at the top and bottom of the page. I thought my daughter might enjoy writing on some special paper of her own, and because she and her friend met playing Minecraft, I figured some Minecraft themed stationery might be a lot of fun. So I set to work, designing a page in the form of a grass block from their favorite game. Get your own free Minecraft style stationery at the link! Pretty cool, huh? Well, my daughter thought so when I handed her a stack of fresh Minecraft stationery and she ran off to her room to write her first letter to her friend. She liked it so much, I thought maybe some of my readers might like to have a copy, too. 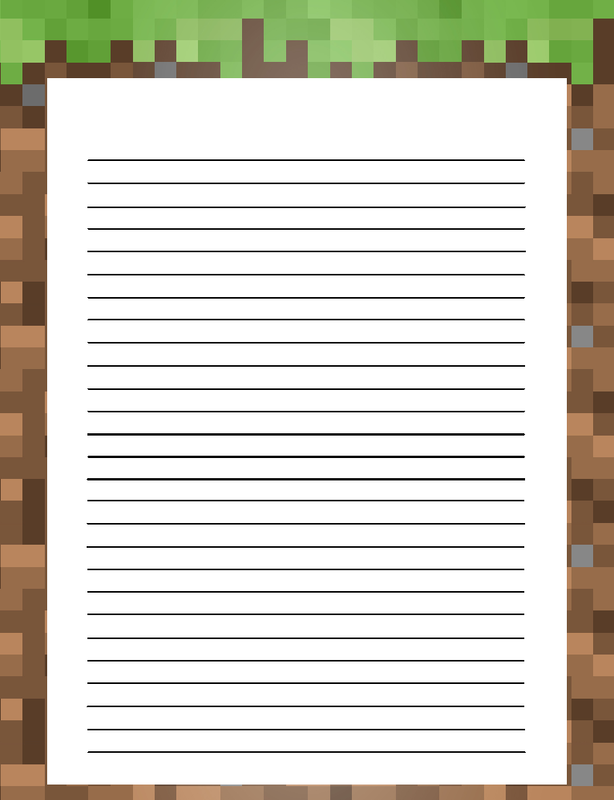 So click here for a printable copy of this cool Minecraft style stationery of your very own! Gracefully written information on this blog are going to support me for my coming assignments. Every point was very clear and taught me few new parameters. I would like to use this information in coming future.